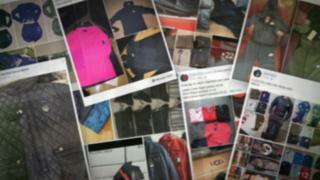 Counterfeit traders using luxury brand names are openly selling goods on Facebook, BBC South East has learned. They have been flooding the social network's Marketplace site with fake products on such a scale that some even offer home delivery. Trading Standards has criticised the social media giant for not doing enough to stamp out the practice, which costs the Treasury millions in tax evasion. Facebook said it was "working to improve" ways to identify violations. BBC undercover reporters found sellers in Sussex and Kent trading from the front rooms of their homes and from vans in pub car parks. All admitted they were advertising fake items, which included jackets, jumpers, tracksuits, boots, trainers, handbags and perfumes with brand names such as Gucci, Chanel, Ugg, Nike, Armani and Hugo Boss. The BBC reported two of the sellers it bought counterfeit goods from to the social network. Neither was removed, despite the fact they openly admitted they were selling replicas. Mike Andrews, lead co-ordinator of the National Trading Standards eCrime Team, said: "In our opinion, we don't think Facebook does enough to remove the infringing goods that we see on their platform. "It's quite easy to go on there now and buy any sort of counterfeit product you would like, and when we've approached Facebook to try and get this content removed they simply don't act quickly enough, if at all, in many cases." One counterfeit trader told BBC South East that he "could get away with it for about six months" before Facebook closed him down, and "then you start again". A Facebook spokeswoman said:"Fraudulent activity isn't tolerated on Facebook. "Making sure people have a safe and positive experience on Facebook is our number one priority, which is why we are working to improve the methods we use to identify potential violations of our commerce policies. "We also encourage our community to report any accounts or content that they feel don't belong on Facebook, including sellers on Marketplace who aren't acting in good faith." Imitation Calvin Klein and Superdry clothes have been among thousands of fake items worth millions of pounds seized by Border Force officers around the UK in the run-up to Christmas. Officers have targeted airports, ports and postal hubs to detect if imported goods are fake, banned or if the correct duty has been paid. Items have included nearly 400 Barcelona and Borussia Dortmund football shirts seized at the Port of Dover and on sale for £16,149 in total; 1,440 Superdry hoody tops selling for about £100,000 seized at Southampton port; and 48 pairs of Nike Vapormax trainers worth £5,760, confiscated at Manchester Airport. Det Sgt Kevin Ives, of the City of London Police Intellectual Property Crime Unit, said fake goods were produced "en masse" by unregulated workers abroad before being shipped into the UK via large organised criminal networks to be sold by criminals. He said they included substandard electrical items and children's toys which put lives at risk. "The large amounts of ways to sell goods online makes selling counterfeit goods easier for the criminals," he said.